The fi-6240Z is the fastest and most compact A4 flatbed / ADF scanner in its class combining exceptional performance and features with the flexibility of flatbed scanning. Protects valuable documents by halting the scanning process when it recognizes that a jam is about to occur. Simplifies pre-scanning preparation and improves efficiency by ignoring documents that trigger false multifeed alerts such as a photo or sticky note. 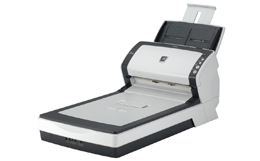 Adobe® Acrobat® Standard and ScandAll Pro are included with the Fujitsu fi-6240Z scanner, which allow you to quickly and easily integrate your workflow. Physical dimensions 11.8 x 22.9 x 9 "